I wish we had had more time to stay here. We stsyed 2 nights. Upon our arrival we were greeted like friends. The staff really wanted to be sure you had a pleasant stay. I enjoyed the old west theme in decorating the park and naming streets. I think our street was called Boothill. The park was all stones, but it was attractive. Every site was unique. We had some cactus and a cow skull. The site was big enough for our 41 foot 5th wheel. The roads were easy to maneuver. The resort was only a short distance from Tombstone. From what we saw in the area, this is the best park to use when visiting Tombstone. The park seemed to be a mix of snowbirds and tourists. First time at this RV Park, A little out of town, but well worth the small bit of a drive. The park is maintained very well, the folks in the office are most helpful, the support staff is fantastic. Quiet at night with the most beautiful sunrises.I will be back time and time again! Used my Passport America 1/2 price. Stayed 1 night. When I received my overnight bill I was surprised. They charged me an additional $10 for other things. Plus you pay for your electric, even if you stay 1 night. We drove in without a reservation, but were charged a $5.00 processing and cancellation fee, dog charges and electric. Nice park, but beware that they are charging you extra. Have to ask for an itemized statement. I pulled in for two nights and stayed for a month. Very friendly staff and the spaces are very large. with my 38" th wheel, crew cab truck. I put the patio down and still had room for two more trucks. 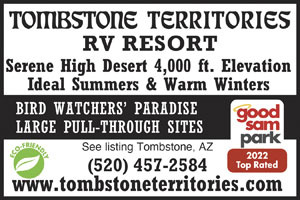 Have reservations for next Sept.
Great park with large sites. The staff was very helpful and went out of their way to even put air in my trailer tires. The pool was nice and my kid lobed it. My only complaint if I were to have one would be there wasn't much for kids to do other than the pool. They have lots of open space and a playground would be nice. We will definitely be back. I actually ended up staying here 2 extra days because it was so comfortable! This is perhaps the only RV "resort" that the internet has actually worked well. I used the laundry, and it was cheap and efficient. LOADS of extended stay folks here, but the place is laid out well so that you don't feel overwhelmed. The best is the 90degree indoor pool & jacuzzi. They have a nice rec hall, and lots of activities going on. They do warn you of the burrs for your dog's feet, but the dog run is nice enough, and there are loads of trails that are nice enough for paw-navigation. They do charge you extra for electricity, but only a dollar or two a day (I have 30 amp, 50 might be more). I stayed in a few other places in Arizona that were not NEARLY as nice that hit you with a $5 per day surcharge. One complaint I do have is that they are listed as taking Passport America, but then when you get there they tell you no, you can't come in with a reservation and use it. I paid $30+ Electricity. Nice park wide spaces and friendly staff. We enjoyed our stay! The pool area and club house are a little run down but the campsites are fine. I would like to have been able to attend and participate in their music nights but Tombstone was calling. It is overall a nice facility! We stayed approx. 4 weeks, after the snowbirds had departed and the campground was 90% empty. This RV park is remotely located but the surrounding area was incredibly beautiful. Tombstone is 10 min away but offers nothing in terms of groceries or other material needs. Sierra Vista is 20 minutes and has it all. An unusually wet late winter and wet spring had left the dessert green and the temps 10' cooler than average. The facilities were as advertised. The walk areas were plentiful, the dog park nice; no RV park is willing to dedicate 1-2 acres for a dog park. Never used the bathrooms. The sites were extremely well groomed and the views of the surrounding area magnificent. The management was friendly and helpful. 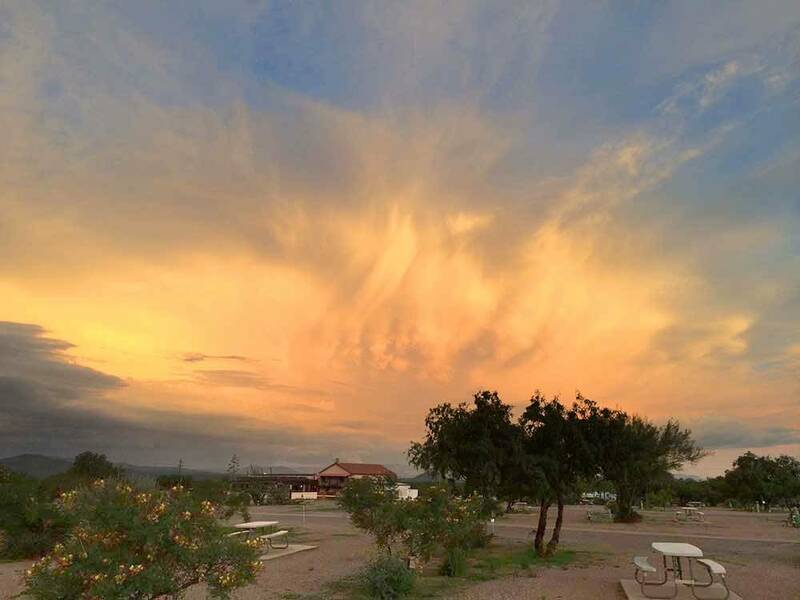 We were a bit far from Bisbee, a point of particular interest to us, but for long term stays in a quiet scenic environment, no place could be nicer.